One of the clues genealogists use to track down information about relatives and ancestors is the person’s surname. If your family has a unique surname, it won’t be too difficult to find people who share it. However, if your family surname happens to be the most common one in the United States – you’re going to end up with a lot of “false positives”. As you may have guessed, Smith is the most common surname in the United States. The United States Census reported that there were 2,376,206 occurrences of the surname Smith in the 2000 Census. People did not use surnames until the Middle Ages. Often, a person’s occupation was used as their last name. There were many blacksmiths in Medieval times. Let’s say the village blacksmith was named Conrad. If there was more than one man named Conrad in the village, people would need a way to differentiate between them. Conrad the Blacksmith would be referred to as Conrad Smith. His son, Everard, would be called Everard, Smith’s son (which later became Smithson). A blacksmith combines two words: black and smith. A smith was a person who worked with metal. Typically, the smith would melt metal down and then hammer it into a useful shape as it cooled. A smith would be identified by the type of metal he worked with. A blacksmith worked with “black” metal, such as iron or steel. Whitesmiths worked with “white” metals, such as tin, silver, or gold. In the Middle Ages, smiths made weapons, armor, shields, tools, nails, castle doors (including hinges, locks and keys), ornaments, jewelry, and household objects (like knives and pokers). By Colonial times, blacksmiths were making hardware for household and farm use, tools for tradesmen’s work, and weaponry for battle. 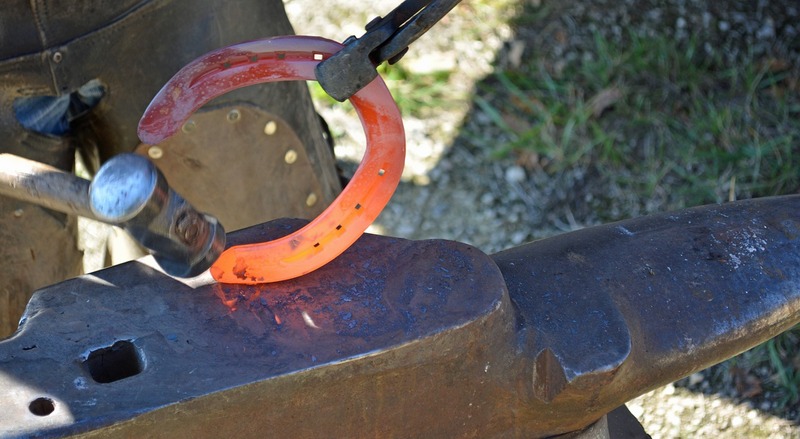 They used a forge, anvil, hammer, and tongs to create horse shoes, anchor chains, hatchets, and much more. Colonial blacksmiths had apprentices. Blacksmiths in the 19th century no longer made nails (because machinery had been developed that made nails). Blacksmiths became speciality shops that made tools, repaired items, and shoed horses. As such, there were a lot of people who had the surname Smith – but who were not genetically related to one another. Americans who have the surname Smith do not share a common lineage. The only thing they have in common with other Smiths is that they all have an ancestor who was a blacksmith (or who was the son of one). The result is that genealogists who have the surname Smith are going to have to work harder to find information about their relatives than other genealogists will.